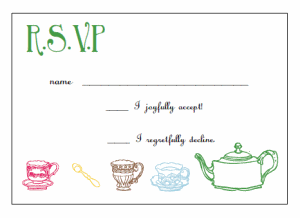 These printable tea party invitations are perfect for a good old tea party to a tea party theme birthday. They can be used for kids and adult parties, featuring a colorful and whimsical tea pot and tea cup pattern. Use this interactive template to print your own invitations and create fabulous handmade invitations. For best results simply print the invitations onto heavy cardstock and trim to size using our handy cutting guidelines. Best of all, they are FREE, making them the perfect affordable solution to your party invitation needs! An added bonus - I created a R.S.V.P to go along with this invitation! I used the same whimsical pattern to create a coordinating printable R.S.V.P card. The added touch makes for a very fancy and well branded tea party. 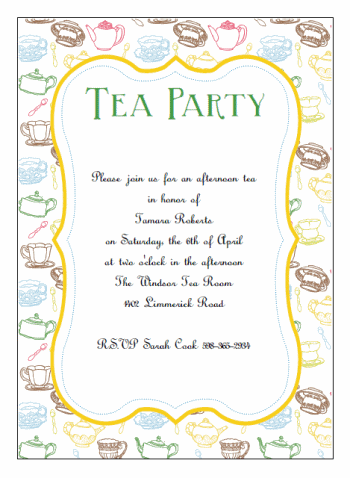 Click on the pictures and links below to save a copy of the printable tea party invitations and R.S.V.P file to your desktop. Open the file and go to work. These invitations are interactive PDF files. You can change the text to insert your very own wording, as well as change the fonts, spacing and alignment, and the font colors. Using the invitation templates is pretty easy. Highlight the text you wish to change and press and hold the "CONTROL" and "E" buttons at the same time. A tool palette will pop up allowing you to change the fonts, colors, and alignment. Enjoy! To make your own easy as pie handmade invitations using our printable tea party invitations template, simply print the file onto some heavy weight cardstock. I recommend 110lb. plain white card stock. Use our handy cutting guidelines to cut your invitations and r.s.v.p cards to the correct size. The invitations are set up to create a standard 5 by 7 invite, so finding envelopes should be a snap. You can keep it simple by trimming the invites to size and popping them in the mail, OR you can go all out and turn them into a fancy work of art. Try attaching the tea party invitations to some nice textured and color coordinated card stock. You can even tie a nice ribbon around them and attach your r.s.v.p tied within the ribbon or punch a small hole and run the ribbon through it.